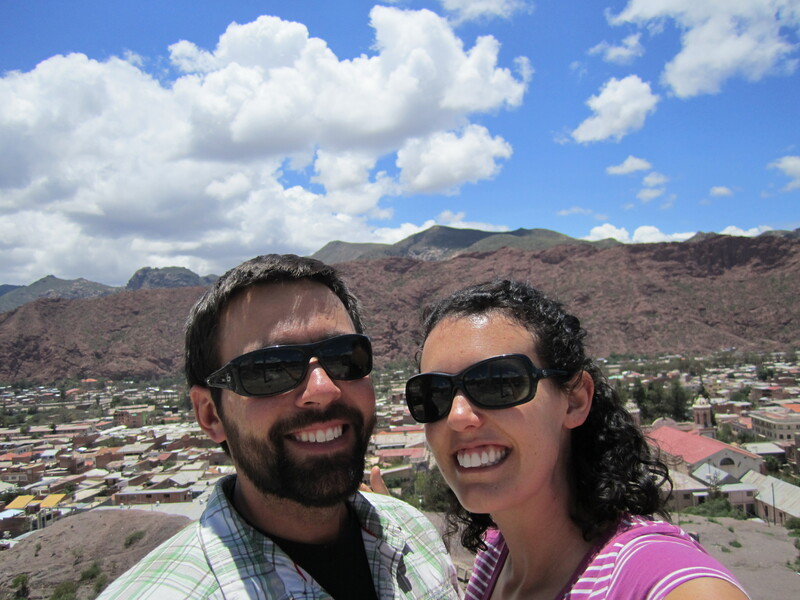 After helpful Spanish lessons, feeling like locals in Sucre, and a quick stop in Potosi, it was time to make our way to Tupiza. 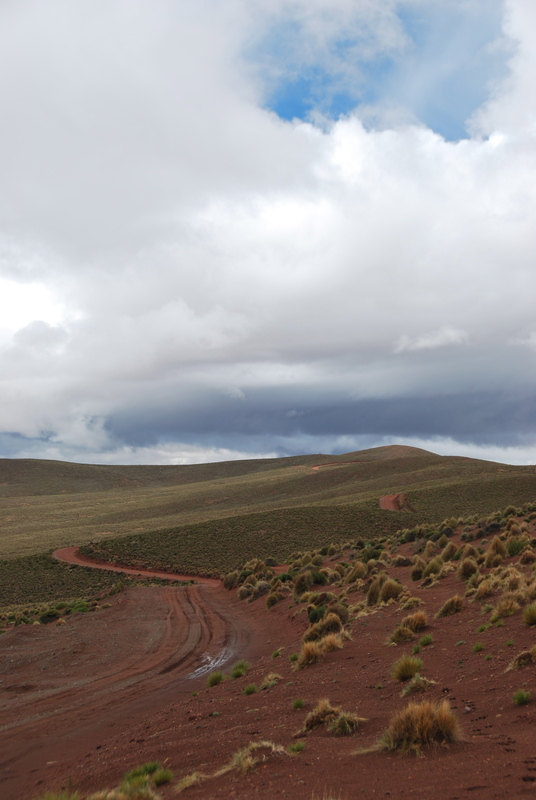 This is where we were going to organize our tour of South Western Bolivia, which of course included a visit to the Salar de Uyuni (the world’s largest salt flat, and Bolivia’s most famous tourist destination). Prior to our tour we had a some time to hang out in Tupiza and explore the area. The city is a pretty tranquil town, and the surrounding mountains were breathtaking and made us feel a bit like we were at home. Also, if you like mediocre pizza, you’ll love that every restaurant here seems to offer their own version. At the mirador overlooking Tupiza. 1. 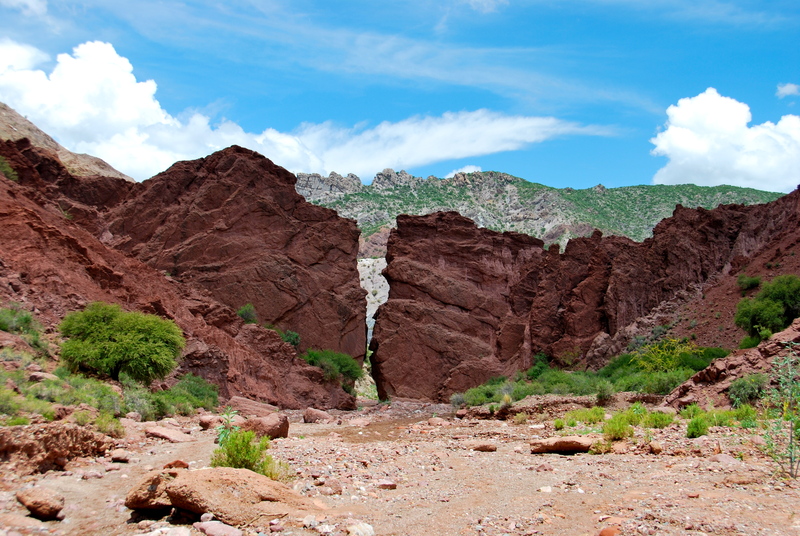 Go horseback riding through the canyons. 2. 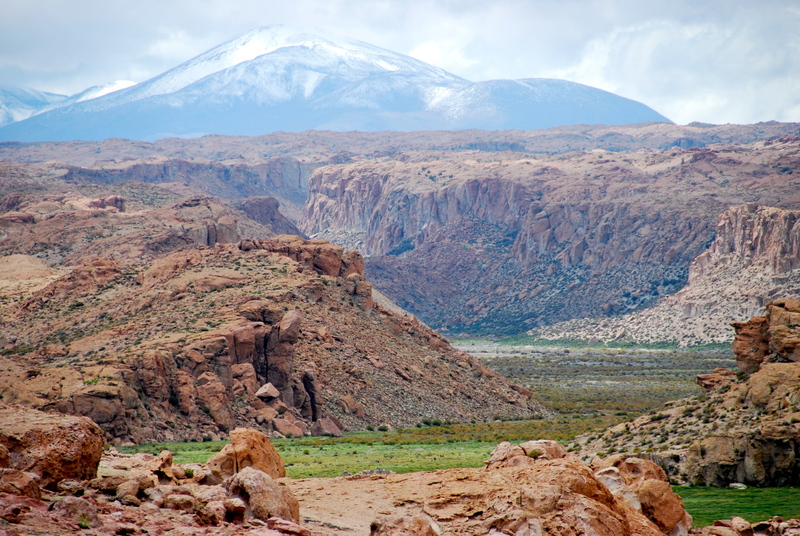 Book a tour through the Southwest Circuit and to the Salar. Now, at one point in our adventures, we said this would be the last horse ride, but when it only costs five dollars five per hour, how could we refuse? We walked to the farm where we would embark on our horse ride and we met our unassuming guide. He was around 15, sported floppy hair, converse, and tight jeans, not of the Wrangler variety. We were especially impressed with his ability to wear skinny jeans and yet still have them sagging a little too low. He was not what you would normally consider “a cowboy,” but he seemed more than proficient in readying the horses. We suited up, mounted the horses, and were off. Every now and then, our horses would get excited and take off running for a bit. 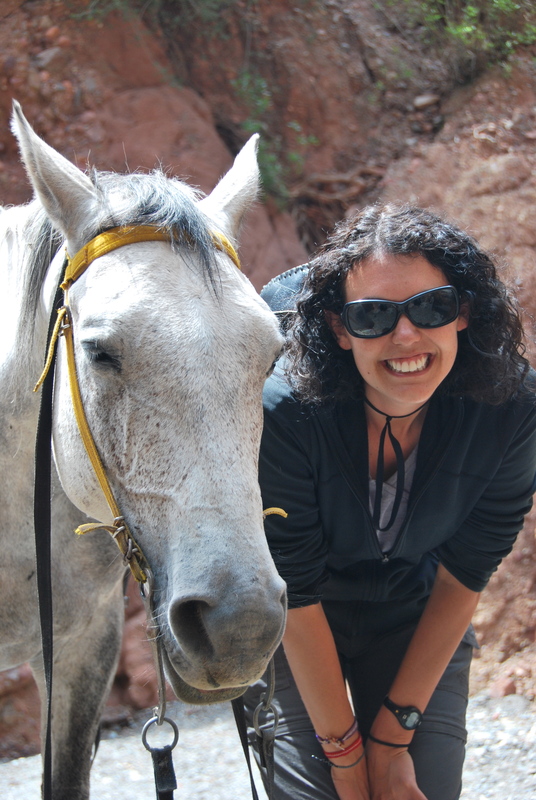 It was thrilling to race through the canyons on the back of a galloping horse. 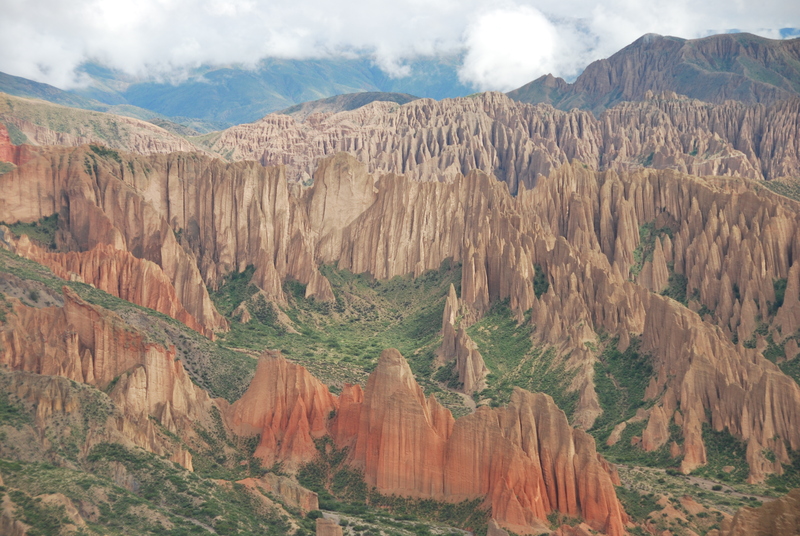 This area of Bolivia looks very similar to Utah or the Grand Canyon in The States. 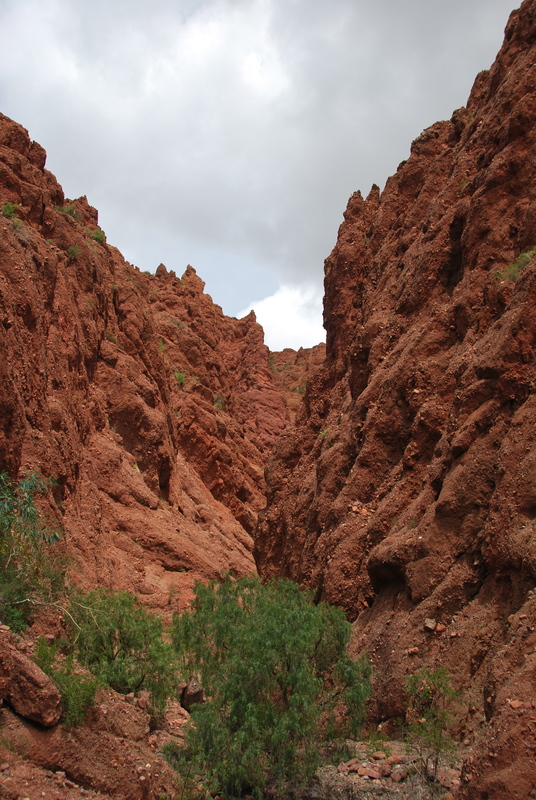 The surrounding hills are deep red and the landscape, while barren, is striking. Canyon Land - You got to be tough tree to make it around here. Kristen and her trusty steed. Dry riverbed and great hills. 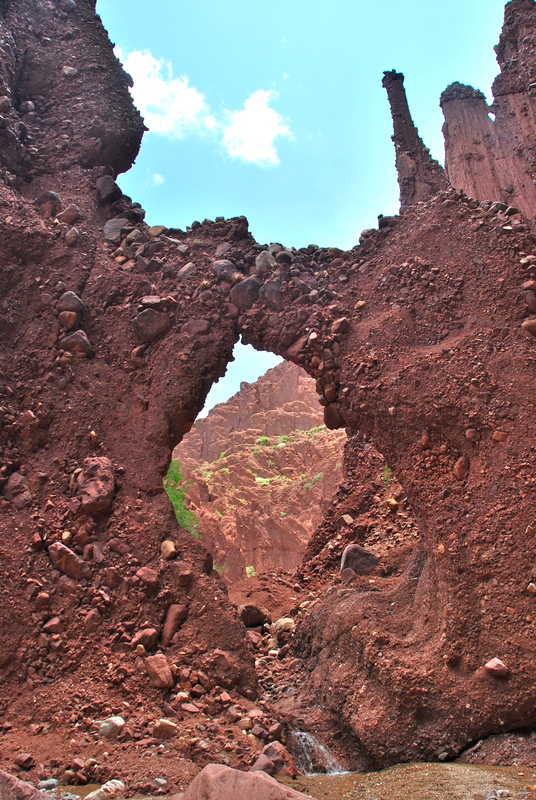 We rode into two different canyons and each time, we left the horses to explore deeper on foot. It was nice to give our legs and backsides a break from the saddle, while we hiked the canyons. Kris riding through, like the horse riding pro she is. 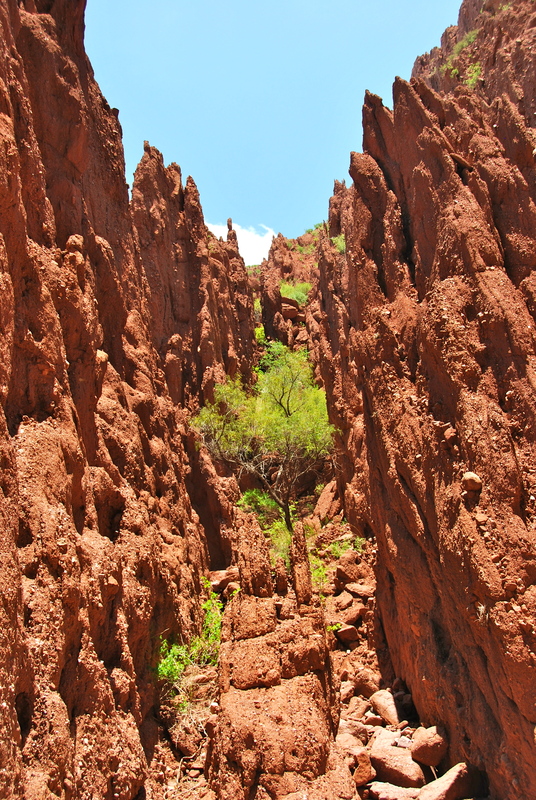 The water has cut its way through the canyons and has left some really cool rock formations, with plenty of places to explore in between. Not quite as fragile looking as the Delicate Arch. Oh red rocks, you remind me of home. This area is near where Butch Cassidy and The Sundance Kid were killed after a raid, so Joe was looking everywhere for lost treasure. (We need to find something to keep paying for this adventure.) No luck. Guess he’ll just have to go back to work at some point. Will we fit through there? We made it back to town just as huge and dark clouds rolled in, and luckily, we weren’t quite as sore as we were after our ride in Colombia. 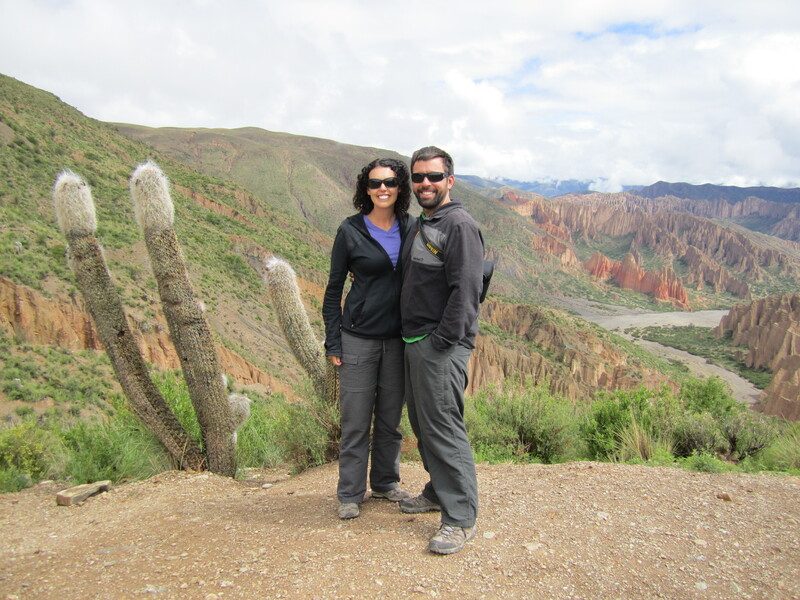 Now, on to the start of the Southwest Tour (which ended up being one of our favorite things in Bolivia)! 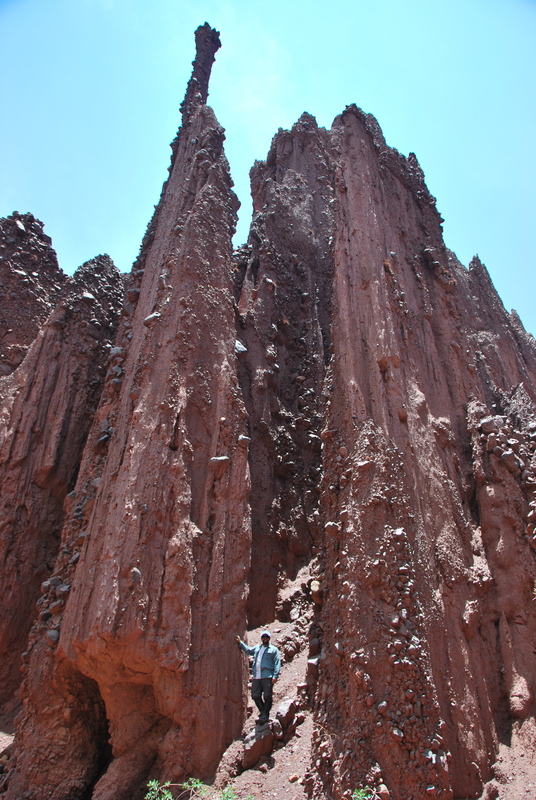 First, we were told by many people (and travel guides) to start our tour from Tupiza and not from Uyuni for a few reasons. If you are in a major time crunch, Uyuni will work in getting you to the salt flats, just be prepared for hundreds of tour operators offering the same (and seemingly mediocre) service. Tupiza only has a few tour operators, and most have better reputations, which leads to fewer headaches when booking a trip. From Tupiza we were able to organize a 4-day trip, leaving from Tupiza and ending in Uyuini. Along the way, we would passed some breathtaking vistas and at times felt so far removed from everything. 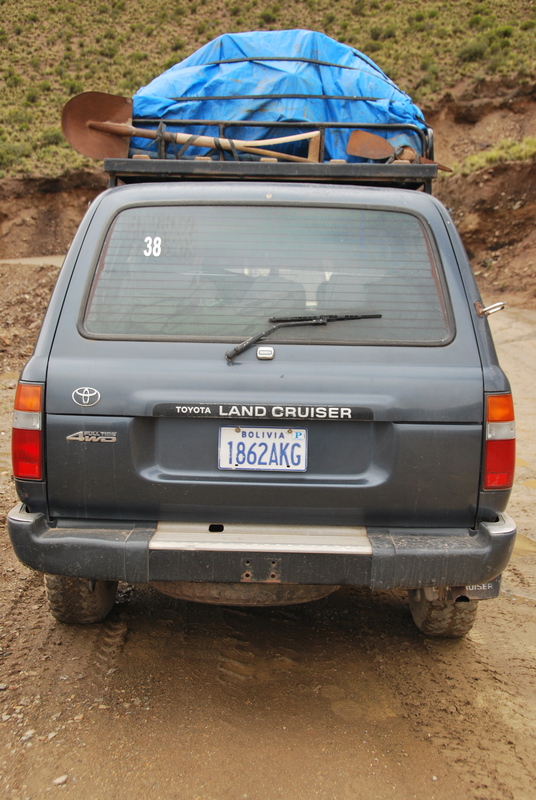 The entire trip was done in a Toyota Land Cruiser which carried extra fuel, a pick axe and shovel (luckily, we never needed the pick axe or shovel), and good 4×4 (a MUST for driving in the wet season!). All these precautions were necessary because we traveled around 12 hours per day on rough, muddy roads, and climbed mountain passes at altitudes greater than 16,000 feet. Our tour group consisted of the two of us, two girls from Argentina, the cook (Naomi) and the driver/guide (Segundino). Our guide was great, and he was always safe and attentive to our needs. Our needs mostly consisted of pulling over to stop so we could take yet another picture. He never took any chances, and was always tinkering with the car whenever we stopped. He was quick to spot wildlife, and seemed amused by us and the scenery. At no point did this Bolivian guide pop any adult beverages, unlike someone else we all know and love. 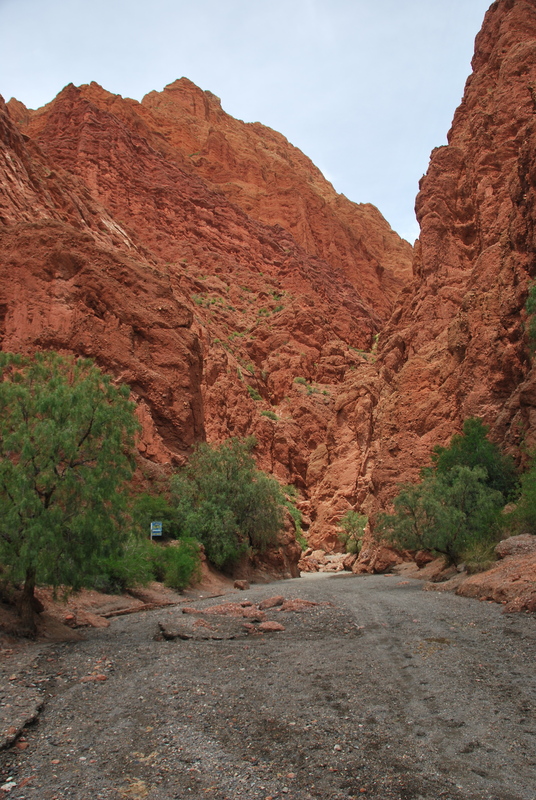 As we climbed out of Tupiza in the Land Cruiser, we were treated to some amazing canyon views. View of Sillar: So all we have to do is cross that? Joe, Kris, and the Cactus - Like how Joe positioned himself to be taller? 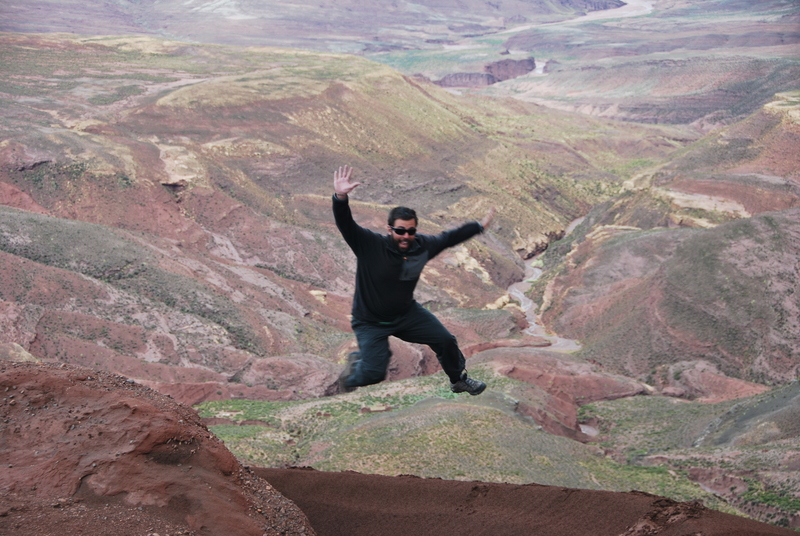 Joe jumping at Paso del Diablo - We will talk about the broken leg later. Our first day on the tour was fairly straight forward with just a few lookouts along the drive. The amazing part was that it seemed like were in the middle of nowhere; we didn’t even have cell phone service! View from San Antonio de Lipez, where we spent the night. 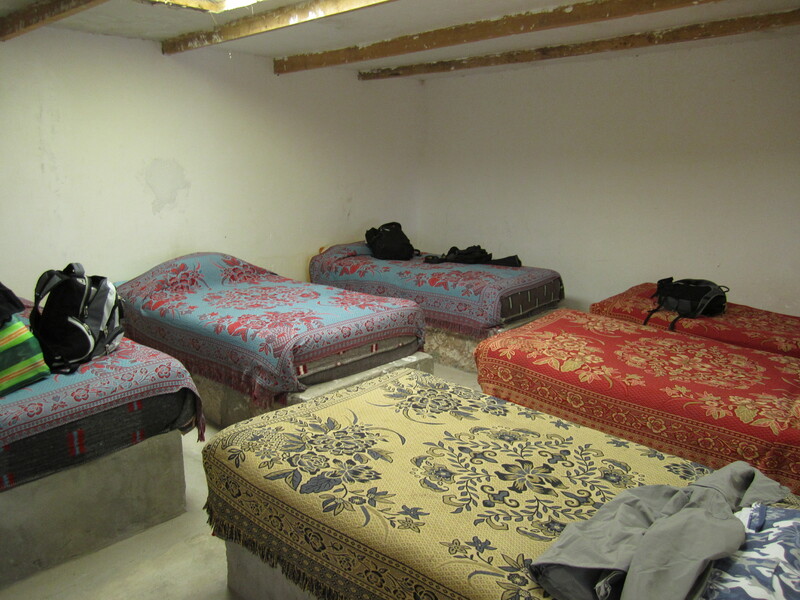 The accommodations along the trip were basic at best, but they suited our needs. All of us shared a room and dined together. Also, the food was pretty good on our trip, even if our cook was very sick the first day. Our second day started off very early (4:30am), as we had a great distance to cover, and the “road” was in rough condition because of the previous night’s rain. 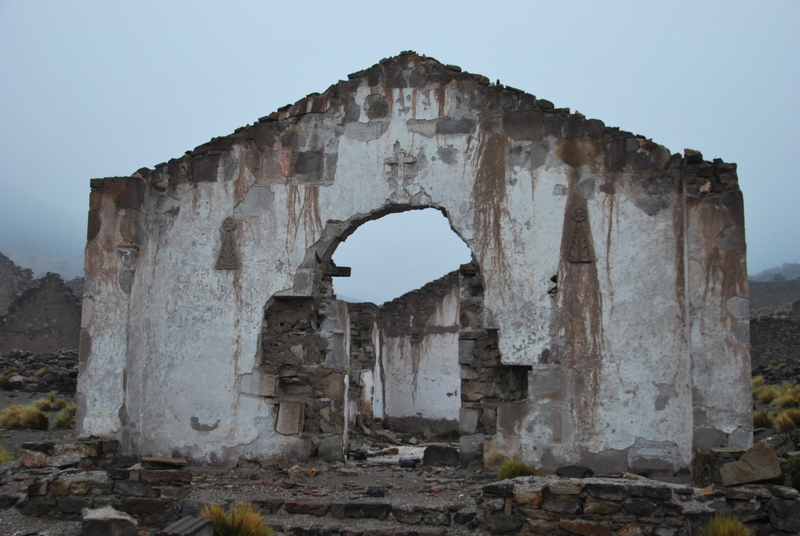 Shortly after the sun came up, we stopped at Ruinas de San Antonio, a ghost town. 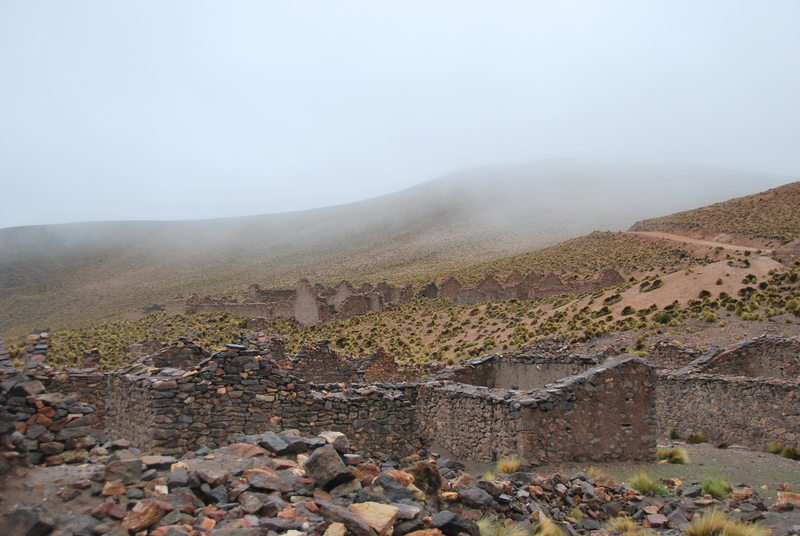 This town was built around the 1600’s when the area was very wealthy from nearby mining, but there are conflicting reasons about why it was abandoned. 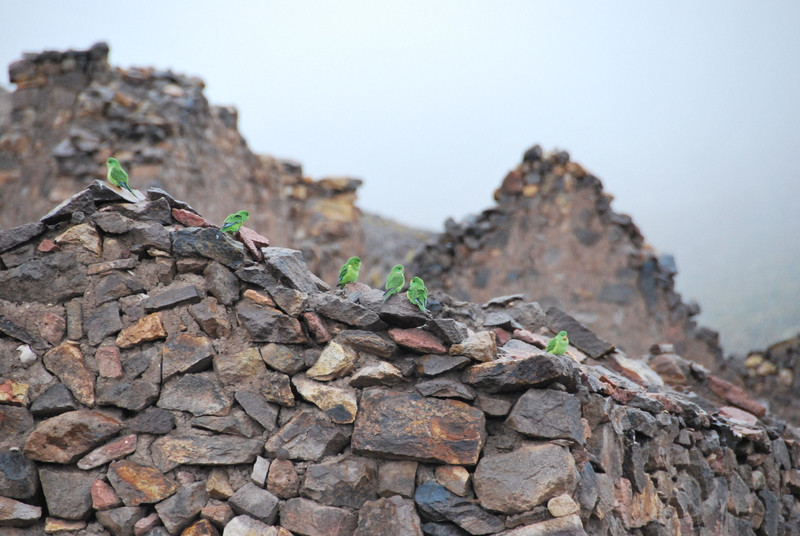 This was an eerie place with all the old ruins, and we were the only ones there to explore them. Some resourceful animals have moved in to the area, and now call the town home. 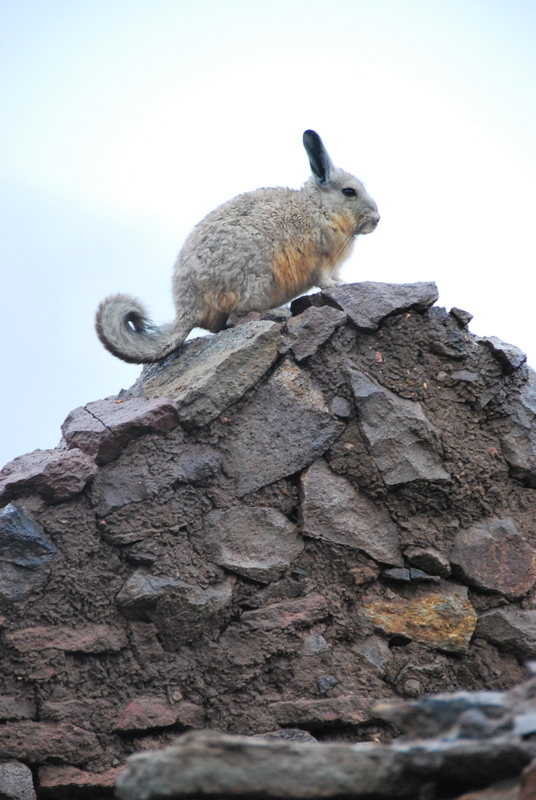 Viscacha, the new town rodent, I mean, resident. Are those really parakeets? Not a bird you expect to see at 16,000 feet and freezing. After this pit stop, we headed to one of the highest stops on our trip. There was a nice view of a lagoon in the distance that was stuffed full of flamingos. Unfortunately we did not get close enough to take pictures of these birds. Kris trying to stay warm at 4,855 meters above the sea. 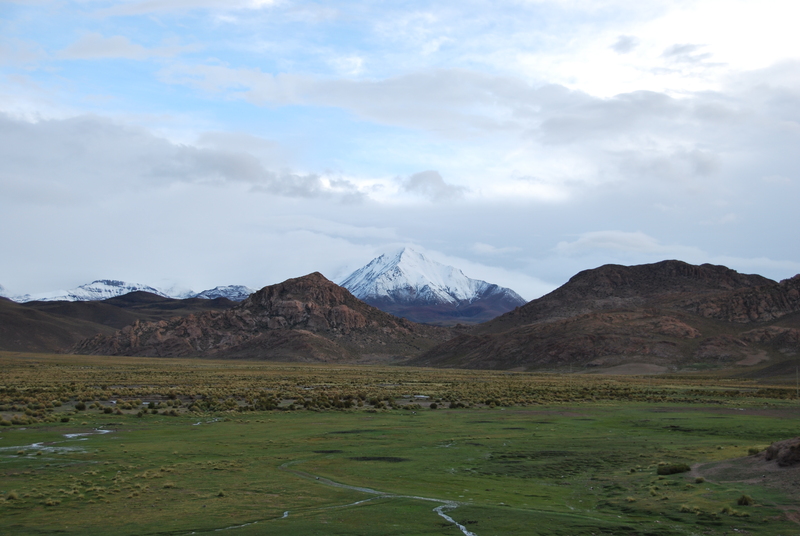 We descended from the high altitude we headed into another beautiful valley. Again, this reminded us of the Grand Canyon, but had its own unique beauty. 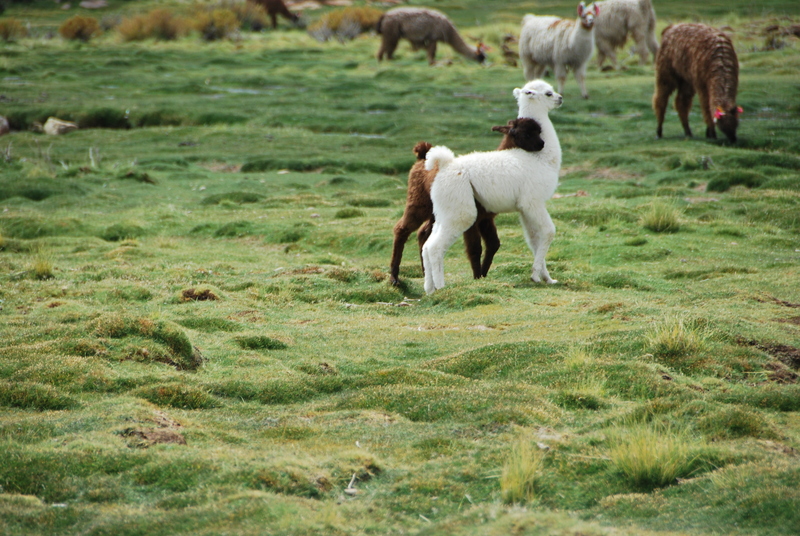 Kristen was VERY excited about the huge number of baby Llamas we saw. This is the time of year that the Llamas are giving birth, and Kristen was more than happy to take a lot of pictures of these cute little guys. Brand new and already best of friends. Try to hold back the awwws. 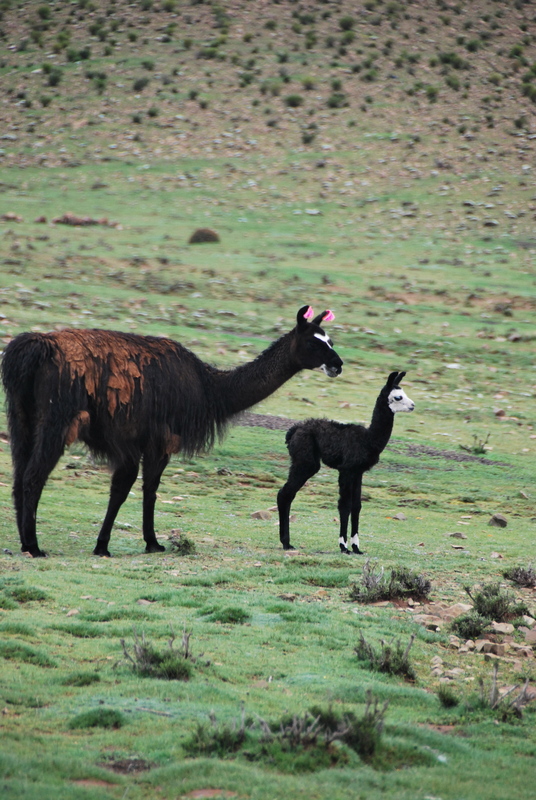 We even found a baby llama, which our guide said was only a day or two old. Okay, it is fine to awww here. We have many more pictures of these adorable guys as it is impossible for Kristen to resist so much cuteness. 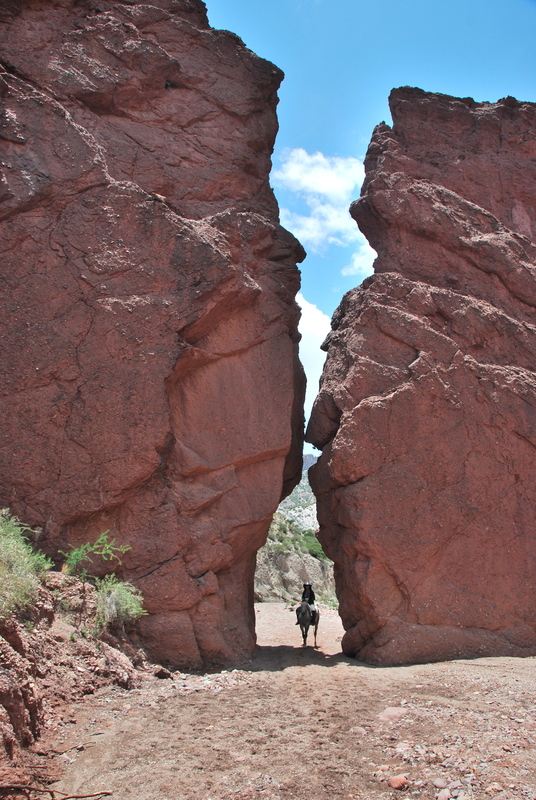 So far, the Southwest has been a blast to explore. With all this open space, it was initially hard to believe that this is a major tourist destination. There is still much more to come from this tour, including thousands of flamingos, bumpy roads, beautiful lagoons, and the world-famous Salar de Uyuni. 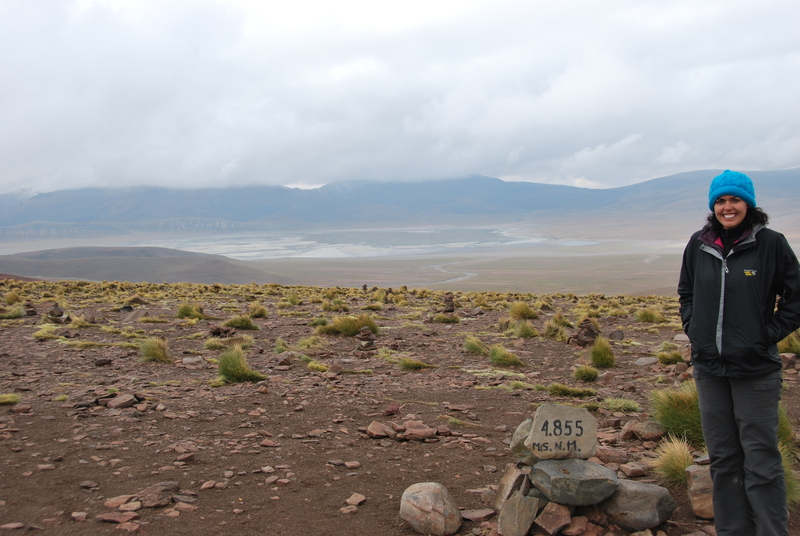 This entry was posted in Bolivia and tagged 4x4, bolivia, horse ride, land cruiser, salar de uyuni, salt flat, tour, tupiza. Bookmark the permalink. Awwwwww! Baby llama faces! One of the pictures looks like a painting. I was like, why are they including a picture of a painting in their blog? But no; it was a real picture. … Aaaaaand I still hate both of you. But it helps to know that you had a long time in the car. 12 hours– gross. I hope you had enough Bonine to last you.